I love the Kardashians. I couldn't care less what people think about them but I am addicted to KUWTK and following their lives. I did find the idea for this book a bit trashy but was interested to read it. Well, after reading it I'm glad I did but for the most part it was a waste of time. Pam was first the nanny of Brody and Brandon before Bruce took her with him when he married Kris and she then became the Kardashian nanny. The first 60 or so pages are about Linda Jenner, Brody and Brandon and the relationship (which Pam stresses was only ever friendship) with Bruce Jenner. I wasn't really interested in this part of the book, or the letters that Pam wrote to her parents that were dotted throughout the book. They just felt a bit randomly placed, and probably used just to pad the book out a bit and make it seem longer than it is. The bits about Pam being the Kardashian nanny weren't very revealing and this certainly isn't a tell all book where she dishes the dirt. Instead she speaks about being the nanny of the Kardashians with such love and warmth that it is clear that this is a woman who loved those kids and the time that she spent with them. She also speaks about Kris being a bit of a ballbreaker (well, we know that) and how Kris always wanted to be famous and how she loves name dropping and being friends with other celebrities (well, we know that too) and how you should never forget the broccoli unless you want to face the wrath of Kris Jenner. Overall it was interesting to read about this girl from the Midwest moving to L.A. and becoming the nanny of what would one day be one of the world's most famous families but ultimately Pam didn't spill any juicy secrets, she mentioned how she would overhear conversations during the O.J. Simpson trial but how she wouldn't feel comfortable divulging them in the book, boooooring. 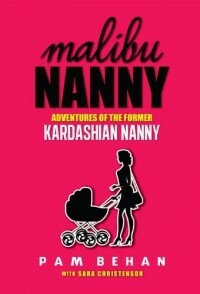 The book will probably sell because of the subject matter but perhaps the authors obvious love for the Kardashian children and Bruce, who came across quite well in the book prevented her from revealing anything that was actually worth reading about. The book ends saying 'to be continued...' but to be honest there isn't much else she could say about the Kardashians unless she was willing to be more open, if the next book is just about Pam and her life after leaving the Jenners then I won't be looking out for it.